AllVoices, a news aggregation site that focuses on citizen journalism, recently received a $3 million cash infusion from VantagePoint Partners. The two-year-old startup now has total funding of $9 million. The site was co-founded by CEO Amra Tareen, who realized the value of citizen journalism in 2005 when she was an aid worker after the Pakistan earthquakes. Tareen says that plans for the immediate future are to focus on the hyper-local content of the site. Long-term goals are “to be the voice of citizens for all mainstream media outlets,” which would mean overtaking competitors like NowPublic and CNN’s iReport. Similarly to those sites, AllVoices provides a platform for users to submit blog posts, images, video, and more. It can tag, rank, and sort the submitted content while also filtering for spam, fact-checking, and assigning a credibility rating to the reporter. The technology behind it all is proprietary, for which the company has filed three patents. 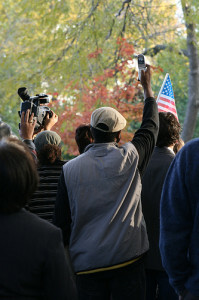 Site users can file their grass roots journalism through their computers or via cell phone using MMS and SMS. Although there is a staff of 10, one of AllVoice’s catchphrases is “unedited by humans.” In addition to those paid staffers, AllVoices also has an “Incentive Program,” which outlines payments for user-generated content. Payments to reporters are divided into two categories: one is based on the number of hits (100,000 views within 15 days of posting will earn $250, and so on), and another is based on brand/reputation for more prolific reporters. We not only let users see the page views of their stories, but we give them a ‘reach’ button, which tells them where the audience is coming from. It’s better than blogging. Then we add a social-media dimension, conveying stories automatically to Twitter and Facebook. When you create communities around content, it creates more value for that content. […W]ith any news story, we send out matching algorithms connected to the location of the report to see whether it’s been reported elsewhere. If the algorithms don’t find anything, it’s going to keep the ranking for that story low, suggesting it may not be credible. If the user is a first-time writer, the credibility rating would be even lower because we don’t know anything about the user. So far, iReport is still ranked as the number-one citizen journalism site by Nielsen Online, with more than 477,000 registered users and over 16,000 submissions each month. AllVoices is not too far behind, however, with over 300,000 registered users. Although English is currently the only supported language on the site, 60 percent of AllVoice’s registered users come from 160 countries outside the U.S. Image by quinn.anya on Flickr, used under its Creative Commons license.